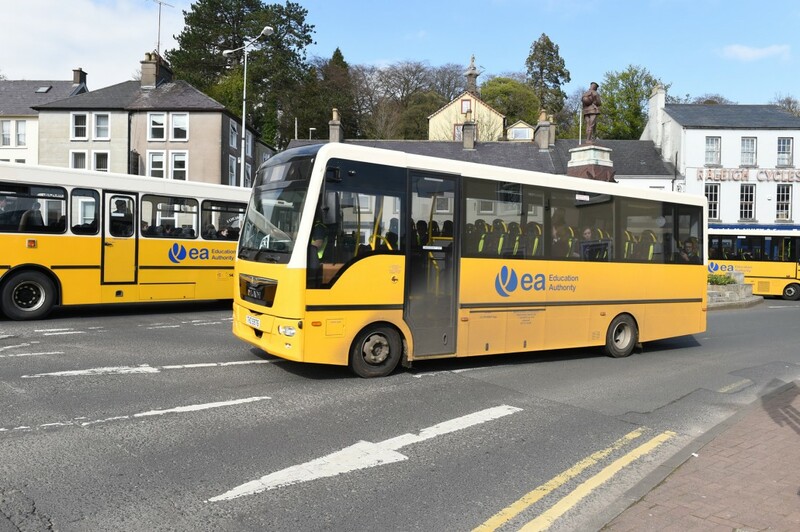 BUS drivers have voiced their concern about the future of school transport in Fermanagh by holding a protest outside the Education Authority’s Sligo Road Depot. Led by Unite the Union, the protest was the reaction to a review of home to school transport recently launched by the Department of Education. Speaking to the Herald, Ciaran McCallion, a former yellow bus driver and Unite representative said that each choice laid out in the Department of Education’s online review was unviable. He added that Fermanagh had a substantial number of transport routes servicing rural schools. “The schools themselves could end up reducing numbers and we could see amalgamations where we are reducing the number of schools and transport. It has a knock-on effect,” Mr McCallion said. As part of the Department’s consultation three possible options are set out asking respondents to choose between charges for school transport, an increase in the distance for free transport eligibility or providing free transport only to the nearest school within the chosen category. While commenting on the topic he added that any increase to current walking distances would impact a lot of children who may be expected to “walk along country roads with no lights, no foot paths, on dark mornings and in severe weather conditions, if they decided to implement this”. In addition to this Mr McCallion warned that there could be potential knock-on financial effects, as well as job losses. “They’re trying to introduce a small cost which we predict will be a very minimal cost to get this over the line. “Once this goes over the line there could be a gradual increase on costs. “Transport is not a privilege but a right to the children,” he added.